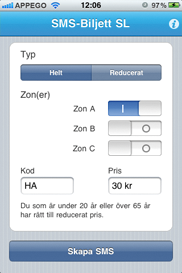 The app was developed to simplify the purchase of SMS tickets for Stockholms public transportation. The app is currently only available for the iPhone. The purchase is done in three simple steps: select the price type, select which zones you plan to travel in and then press "Create SMS". The app generates the ordering code and prepares a text message in which the receiver has been preset.